Hola Divas! If you will recall, we discussed Joshua earlier this week and the choice he had to make before going into battle. I would call getting ready for battle an “unglued situation”. When I come unglued, I fly into action to “fix” the situation. Stopping to choose a side is the last thing on my mind. In the Unglued Participant’s Guide, Lysa gave us some action steps on how to “stay on God’s side”. 1. Use Truth–What is REALLY true about the situation or person. There are so many outside influences that sometimes getting a little truth about the matter is a really wise thing to do. Remember, our perception may NOT be the reality. 2. Use self-control. I can only control KATINA! In Unglued situations, I often behave in ways to control the other person or the outcome: pouting, yelling, sulking, silent treatment, etc…) As Lysa says, “Our feelings are indicators NOT dictators”. 3. Use prayer–Pray for the person who is getting on your last nerve! I think it is only natural to pray for the resolution of a situation that has us unglued. The only issue with that is what if the situation does not resolve? God, help me choose to be on YOUR side, trusting that YOU will help me face things outside of my control without acting out of control. Read chapters 1-2 in the Unglued book! Hola Divas! Welcome to week three of our bible study, Made to Crave by Lysa TerKuerst. If you are just joining us, you may want to check out previous Made to Crave posts or visit our Meetup Page. During each session, Lysa gives us a theme word. For the first session, the word was empowerment. Our word for this session is Determined. Webster’s online dictionary defines determined as: having made a firm decision and being resolved not to change it. At the opposite end of the “mindset spectrum’ is desperate. Desperate is defined as: feeling, showing, or involving a hopeless sense that a situation is so bad as to be impossible to deal with. As Lysa so eloquently put it…Desperation breeds defeat. When we are desperate, we want instant gratification. We become laser focused on what we want. We see what we want. We think about what we want. We simply MUST have it or we couldn’t possibly live on! In desperate times, we just might do, say, eat, or give away….ANYTHING! One day when Jacob was cooking some stew, Esau arrived home from the wilderness exhausted and hungry. I am sure NONE of you have eeeevvvver gone into drama queen mode (the attitude, pouting, noodle-necking, sulking, silent treatment, oh no I am fine…just about to die), when you desperately wanted something. Divas, we have to be careful with desperation…it breeds defeat. We want …..and we want ….and we start manipulating to get what we want and before we know it….desperation turns our manipulation back on us, and WE GET PLAYED! But Jacob said, “First you must swear that your birthright is mine.” So Esau swore an oath, thereby selling all his rights as the firstborn to his brother, Jacob. Then Jacob gave Esau some bread and lentil stew. Esau ate the meal, then got up and left. He showed contempt for his rights as the firstborn. Divas would you trade your inheritance for soup? One method of handling “physical” desperation is to not allow ourselves to get soooo hungry we become desperate. Part of the homework for this week is to determine in advance what we are going to eat so that we are not caught off guard…exhausted and hungry! If you need help, check out our post on the plate method and plan out at least 3 days worth of meals. Maybe you don’t have a food issue. Where do you become so desperate in your life that you make “feel-good right now” decisions with painful long-term consequences? Come on back later this week as we talk about “spiritual determination”. Keep us posted about how things are going in the comments section! We had soooo much fun at our Girls’ Night Out Spa Party! Thank you so much to everyone who attended! 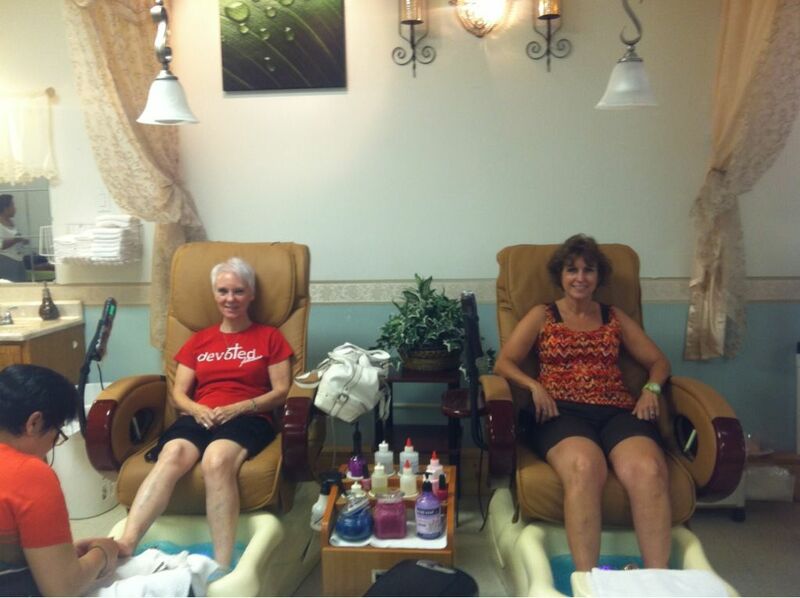 From manicures to pedicures and food all in between…….we had a blast! 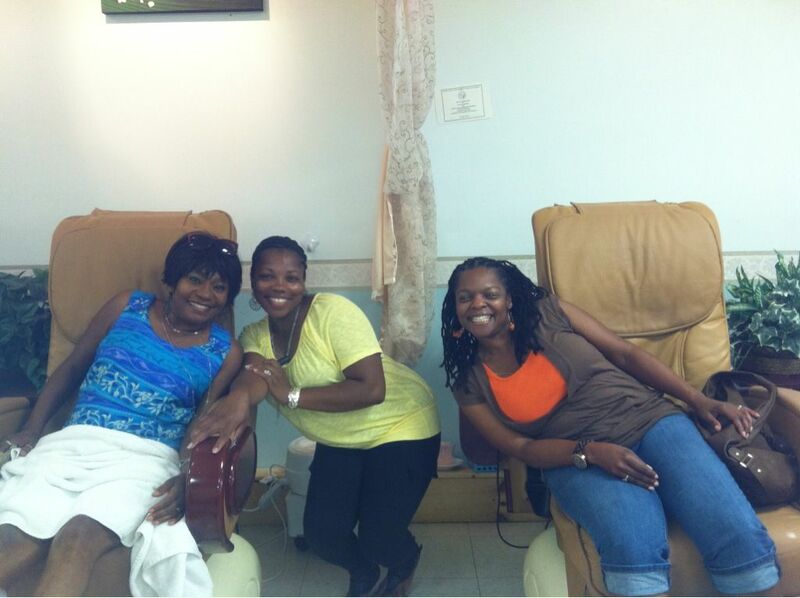 I think we kept the nail salon owners VERY entertained with our dancing! Not sure anyone has danced at the salon before. Leave it to the Divas to be the first! Dancing through life together couldn’t be more fun! I had a song request that I couldn’t fit into the play list from last week so I just tossed it in for this week. I have done that routine several times so I did NOT practice. Last night, when the song came on, I drew a complete blank. I literally just stood on stage and watched as the “front row Divas” began the routine. Once I saw them get it started, I remembered! I laughed at myself and started the song over! I jokingly announced to the class that they should follow the girls in the front row and not me! My “real job” is a little crazy right now and there are things that I do not like but I cannot change. With the “end of school shuffle”, our home schedule is crazy and let’s not even add housework. To say that my brain is fried, is an understatement. As I stood in front of my class with a lost look on my face, my inner voice was just about to say something negative when I silenced her by laughing at myself and singing along with the music! Sometimes you just gotta accept your humanness and laugh at yourself. Mistakes happen. When mistakes happen, especially when they happen with all eyes on YOU, don’t let your inner mean girl get you off your game. I must admit, my inner mean girl can REALLY bully me. Yesterday, I stood up to my bully by laughing! Perfection and being the “best dancer” was not my goal anyway. 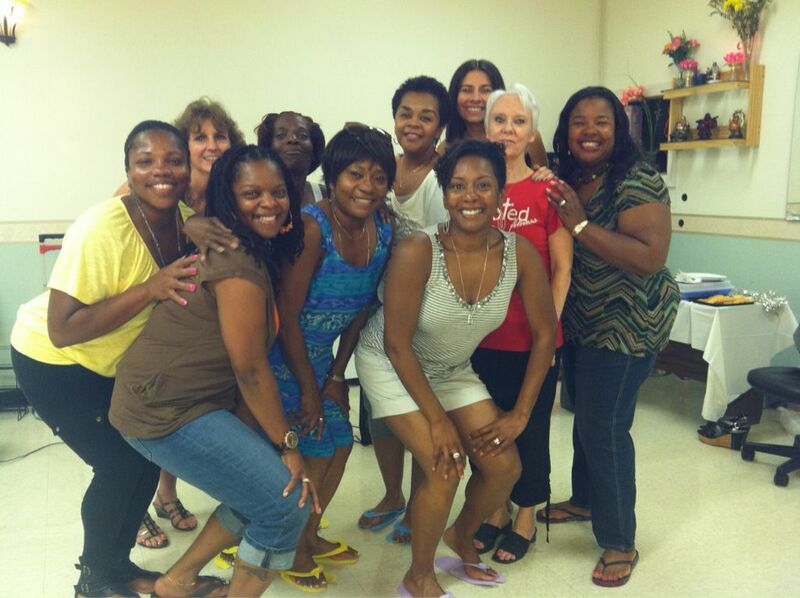 My goal was and is to be USED by God to encourage the heart of women through dance fitness. When we cooled down at the end of class to Kirk Franklin’s “I Smile”, I couldn’t help but catch a glance of how awesome God really is. As I watched all of the beautiful Divas stretching and singing along, in spite of their own personal struggles, it reminded me that it is because of HIM that we can smile when things don’t go our way. Dancing mixed with a little singing and some laugher brought about GRATITUDE! Divas, what do you need to ease up on yourself about and perhaps have a little laugh at your own expense? Divas, we had an amazing workout/praise party on Saturday!! It was truly a “Soulful Saturday”! One of the new songs on Saturday was Awake and Alive by Skillet. Dancing this song was totally out of my “normal” genres of music. I am a R&B, gospel, and hip hop girl. I also love salsa, merengue and reggaeton. I am a beat person. The baseline, the beat of a song is what speaks to me first, then the lyrics. Skillet’s Awake and Alive delivered on both a great beat and ah-mazing lyrics! Larae Puckett, founder of Devoted Fitness choreographed the routine. When we finished dancing to it, the room erupted with shouts! It was a glorious sight! So many temptations and well-meaning obligations get thrown our way from the media, other people, and societal norms. At times, it seems easier to just give in and go along with the status quo. Life gets sooooo overwhelming that we feel as though we are going under. We get so used to things being hard that we sort of fall asleep and go through the motions of barely getting by. We forget to tap into our true power source. I don’t know about y’all but the older I get, the faster my strength seems to fade. Some weeks I look at all of things that I need to do and my strength goes all Scarlet O’Hara… “Let’s think about it tomorrow”. Some times things happen and I don’t understand them and I get stuck on the “Why” of it all. I get stuck on trying to identify WHY things are happening instead of trusting God and allowing Him to breathe His strength into me. I saw a commercial recently for the 5-hour energy drink. Obviously the run down-tired feeling is a national epidemic! When God breathes into us, we realize that we ARE Alive and Awake. I pray to you, Lord. I beg for mercy. I tell you all of my worries and my troubles, and whenever I feel low, you are there to guide me. Divas, let’s not forget to tap into our power source. We are AWAKE and ALIVE!